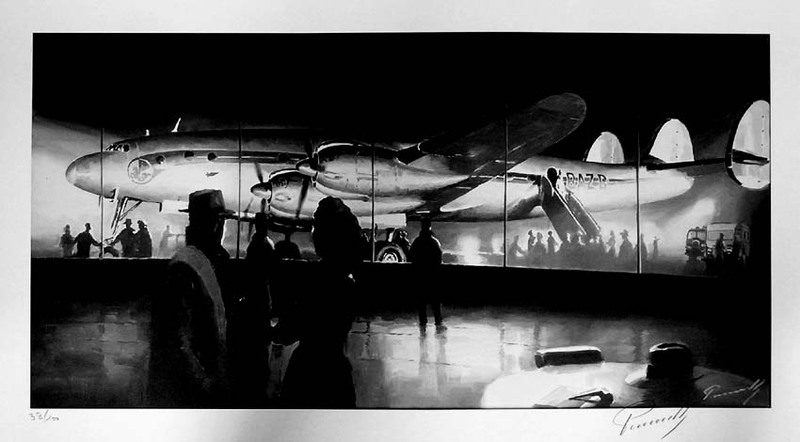 This a 100-copy limited print of a black & white oil canvas from Perinotto, the most talented French official aviation artist. Perinotto manages to recreate the hectic atmosphere of the last moments before the Air France Constellation leaves Paris Orly for a long overnight flight. Compared to the original print of the "Air France Propellers" portfolio, this one has NO fold, is numbered 1 to 100 and signed by Perinotto. -> 300gr high quality and acid-free paper, size 15 8"x 28 9"